So one of the topics I had lots of question on when I started researching outboards for S/V Lady Anne was which OB to select. She came with a mid-1990s Nissan 6 hp two-cycle which (despite what PO stated) refused to start. After taking down the block, I found lots of burned sand in the cooling void and valves...I'm no expert, but led me to believe she had been dropped into the drink or run ashore. Either way, it wasn't going to do the job. I had an older 15 hp short shaft that I used to launch and get to the slip...way more power than needed, and the short shaft made it a bear to adjust throttles, etc. Ultimately, I bit the bullet and bought a brand new Tohatsu 6 SP long-shaft...best decision ever. The SP needs about 10 hours of break in time before you can go full throttle, but honestly, I've never had to use it above revs for about 2 kts. Reverse gear is responsive and the 4-stroke makes for a quieter, better run. Vibration is an issue...the motor will "turn" to STBD on its own unless you rig a line to the stern rings to keep her centered. Love the friction locks and quick disconnect. 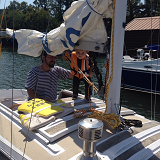 Motor is very light...can lift freehand while at the dock; right over the transom and to the left/right of the split backstay without issues. If I'm feeling particularly cautious, can flip her stern-to and just pick it right off.